This lease can be used by an equestrian establishment of any size, from a livery yard with two boxes to facilities that are used for training or recovery, professionally or privately. Within the document there is emphasis on the care and upkeep of buildings, equipment, facilities and grassland. This is a lease of an equestrian establishment of any size. The facilities could be limited to a single stable block or the most well equipped livery yard complete with indoor school, outdoor arena, other outbuildings and paddocks. The term of the lease should be less than 7 years. The tenant could be either a private individual, or someone running a livery business. This agreement has been drawn to include provision for the upkeep of agricultural land and specifically equestrian activities. 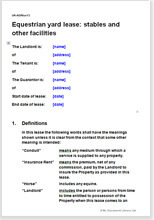 This document does not allow for residential buildings on the land to be let - the tenant (or any employee) should not be allowed to live on site. If you require provisions for letting one of the buildings for residential purposes, use one of our separate residential tenancy agreements for that part of the property, or contact us to have suitable provisions included in the facilities lease. The lease is not suitable if the tenant will breed horses or ponies for commercial reasons (i.e. run a stud). A farm business tenancy agreement should be used in this situation. Also included are extensive drafting notes that will help you edit the document for the exact deal you require.